Return to Asia (part 2: ancestors) – record of m.
Virginia and I awoke early. We decided to let her father sleep in, so we quietly got ourselves together and went downstairs to breakfast. (As an aside, I’ve yet to visit Korea and have a breakfast buffet that was anything but varied and tasty. Unfortunately, that probably means I have too much food.) After breakfast, we walked outside for a bit and got more coffee at the nearby Starbucks, which is somewhat unusual for us while abroad. We went back to the hotel and worked off breakfast in the exercise room before rejoining with Virginia’s father. Before doing anything else, we wanted to switch out of our single room to the two junior suites Virginia had booked for the rest of our stay. (Before you think otherwise, I need to note that she found such an amazing deal that the nightly cost of the two suites was the same as the cost of the single three-bed room.) We got our new room keys and were assured our bags would be moved automatically (which they were). Logistics squared away, we headed out on our first sightseeing trip. We took the municipal bus southeast to Bulguksa, an important Buddhist temple of the Silla Empire. While the original wood structures had long since been burned to the ground (a common occurrence, unfortunately), the stone pagodas and structures remained. It was a very busy site, reminding me of Chichen Itza in that respect (adjusting for location and crowd sizes). The temple bell at Seokguram. After that, we took the bus further up the mountain to Seokguram Grotto. The grotto itself is small and you have to walk about 0.5 kilometers to get there from the main entrance. None of us wanted to wait for a somewhat dizzying bus ride, so we hailed a taxi and took it back to the hotel. We took our guide books and maps to the top-floor bar and planned out the next couple of days over drinks. By the time we finished, we were ready for dinner. So we went back to the restaurant that was closed for lunch the previous day, Bomun Hanwoo. You select your cuts of meat to begin, picking from the butcher’s counter. You’re then seated at a table with a built-in barbecue and dinner begins. We took turns cooking the meat and eating everything else (vegetables, soup, and soju) served with dinner. We went back to the hotel to have dessert and a nightcap to end the day. One of the reconstructed buildings at Donggung Palace. We had planned what seemed like an ambitious sightseeing plan for the day. After a relatively early breakfast, we took a taxi to our first stop, Donggung Palace and Wolji Pond. The palace had been almost 30 buildings during the Silla Empire’s existence, but had been burned later on. 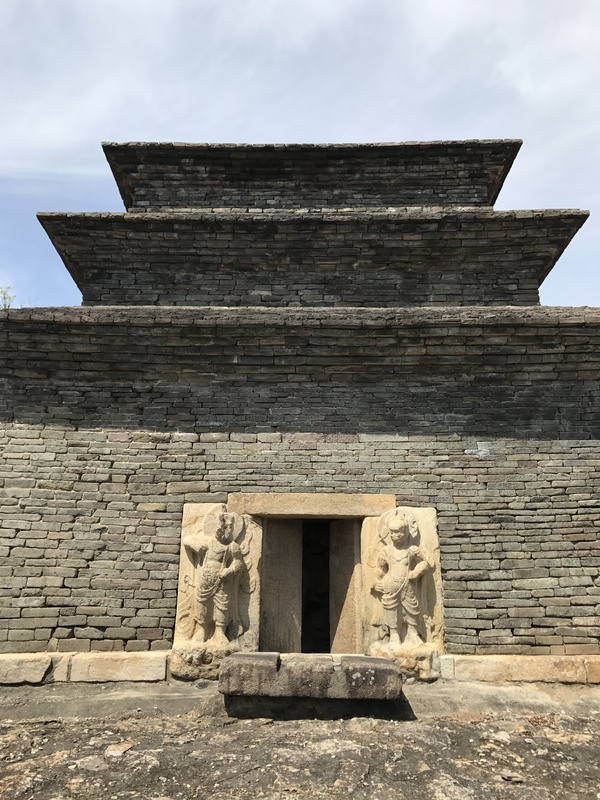 Three buildings have been reconstructed and the foundation stones for the remaining buildings give the visitor a sense of the extensiveness of the complex. On the map, it seemed that we’d have to take taxis to many destinations. But central Gyeongju is smaller than we’d anticipated. As a result, we walked to and around what had been Wolseong Fortress (now under excavation). We stopped at the ancient ice storage, which is intact from the outside but closed to visitors. From there (and after Virginia was inadvertently hit with water from the excavation work), we walked down to the edge of the Gyerim forest, where King Talhae found Kim Alji, the founder of the Gyeongju Kim family (and thus Virginia’s ancestor). There’s a small building at the spot, housing the stele that marks the event. Close by is Cheomseongdae, the oldest surviving astronomical observatory in east Asia. Built in the late 7th century CE, it stands all of nine meters tall. But its construction has meaning in other ways, and now that I work at a planetarium, it was cool just to see that piece of history. It was earlier than expected, so we continued our walk up to a park containing a number of Silla-era burial mounds. Virginia’s father wanted us to especially see Cheonmachong. It’s known for its painting of the heavenly horse, and it’s open to the public to see how the tomb was constructed. Exiting the park, we found ourselves about two blocks from Virginia’s intended lunch destination, Kisoya. We had a great Japanese lunch and then walked around central Gyeongju briefly, hunting English-language books on the region (no such luck). So we took a taxi to Choe’s Old House and Confucian School, only to find neither were open that day. It was mid-afternoon, so we decided to take a taxi to our last stops of the day, Bunhwangsa and Hwangnyongsa. The former still stands while the latter is marked by a placard. Bunhwangsa is notable for its stone pagoda, of which three levels still remain. Having more or less exhausted ourselves, we took a taxi (with the same driver who brought us to Bunhwangsa) back to the hotel, where we had dinner (Japanese again) and settled in for the evening. Unlike the previous day, our sightseeing stops had significantly more distance between them. So we used taxis to get from place to place. Fortunately, taxis in Korea are (from my USA perspective) startlingly inexpensive. First stop: Gyeongju National Museum. We spent about an hour there, walking through their main exhibit on the Silla empire through its rise, unification of the Korean peninsula, and fall to the Goryeo empire. We also saw the Divine Bell of King Seongdeok, built in the Unified era. From there, we went to the Gyochon hanok village for lunch and a walk around Choe’s Old House, a traditional dwelling for a well-to-do commercial family. The Choe family is known for its generosity to the community, and the family continues to live there. Our next stop was the Poseokjeong Pavilion, a little way outside the city. The pavilion, like so many buildings in the region, no longer exists. However, its most notable feature — an abalone-shaped water channel — is still there. Nobles would sit around it and the water would convey cups of alcohol around the shape. While you can’t get next to it anymore due to conservancy restrictions, you can see how it worked. The tomb of Kim Yu-Sin. We finished the day’s tour at two tombs. The first was the tomb of King Muyeol, who began the unification of Korea under Silla rule. The second was that of Kim Yu-Sin, a member of the Gyeongju Kim family and general under King Muyeol. His tomb was different than the others we’d seen: it had a stone foundation and what appeared to be a stone bier in front of the mound. We were all pretty tired at that point, even with all the taxi rides. So we headed back to the hotel for an early dinner. Earlier in the day, Virginia and her father had booked us tickets to a new show called “Performance Silla,” playing at the Gyeongju World Culture Expo. After dinner, we walked to the Expo building for the show, which was perfect for us: we read the synopsis in advance and then enjoyed the dialogue-free performance of music, dance, and acting. I hope it gets more traction as the weather improves and Gyeongju sees more tourism. A nightcap at the hotel and we were done for the day.